February 11, 2010 11:33 ET | Source: Wellness International Network, Ltd.
Wellness International Network recently released a fresh, new look for Accelerator, which enhances weight loss and increases energy levels of consumers all over the world. PLANO, TX--(Marketwire - February 11, 2010) - Jumpstart your weight loss with Accelerator™, Wellness International Network's natural weight loss supplement. 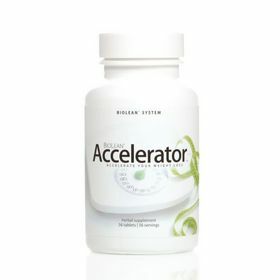 With an attractive, new look, Accelerator enhances weight loss and increases energy levels of consumers all over the world. Ralph Oats and Wellness International Network, an undisputed nutritional leader known for its top-selling weight management line, the BioLean® System, helps people embrace an opportunity to achieve physical, mental and financial wellness. "Before, I felt like I was covered with lead and could hardly move," shares Dr. Mark Pack, a general surgeon from Kentucky who lost 75 pounds with WIN's weight loss products including Accelerator. "Within two or three days of starting BioLean, Accelerator and LipoTrim®, I thought, 'Hey, I think I can actually start exercising. The weight started dropping very quickly. The energy started coming back, and I was sleeping better at night. I thought, 'This is amazing!'" "I struggled with being overweight for a long time, since I was little. It was very frustrating," shares Mona Albiola, a hairstylist from Texas who lost 52 pounds and five dress sizes with WIN's weight management products. "Clothes fit better now and I actually shop for myself! Taking these products feels really good. They helped me a lot. You choose to lose weight or not. I chose to take the products, I chose to eat right, I chose to exercise, that's it." Boost your current routine with Accelerator! Accelerator works by extending the heat-generating actions of BioLean and BioLean Free. When used together, these products provide a well-balanced approach to weight loss, increased energy and detoxification. A privately held company specializing in health and nutritional products, Wellness International Network, Ltd. is headquartered in Plano, Texas, with its European affiliate, WIN Worldwide BV, located in Hoofddorp, Holland. Its South African affiliate, Wellness International Network S.A. (Pty) Limited, is located in Johannesburg, South Africa, and WIN Worldwide Mexico S. de R.L. de C.V. is located in Nuevo León, México. Founded in 1992 by Ralph Oats and his wife, Cathy, WIN operates in many countries throughout North America, Europe and Africa, and is far and away the forefront leader in global network marketing. Management Team 500 Magazine recently selected Wellness International Network as a Top 500 company. WIN's complete nutritional line has been listed in the Physicians' Desk Reference® (PDR®) for Nonprescription Drugs and Dietary Supplements. In the Netherlands, WIN's products are listed in the Z-Index, a database of products associated with the public pharmacy, used by doctors, pharmacists, businesses and government. Serious athletes are delighted to learn that WIN Worldwide BV participates in the Netherlands Security System Nutritional Supplements Top Elite Sports [NZVT] system; for additional information click here. Learn more about why "It Pays to Live Well" at winltd.com.